When Guru Nanak came to this universe, the land of Punjab was dominated by yogis; as far as the spiritualism is concerned. A lot of Gurbani is thus composed in reference to yogi concepts. It will be of immense interest if not ridiculous what the yogis follow. Samadhi i.e sitting in a particular postur is their spiritual activity where they merely follow their thought or imagination. Naturally it looks funny when they describe this imaginative journey of spirit. One prominent yogi Suami Shiv Dayal the founder of Radha Soami sect has described at many places the journey of spirit the surrat. He tells initially at start the surrat has to pass through a very narrow passage. It is narrower than the tip of a pin. Then the passage is some what oblique and then the surrat rises. 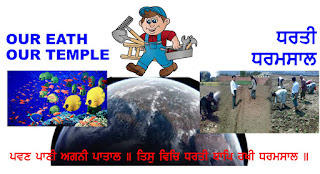 There upon Soami ji describes various khanda the regions in sky. 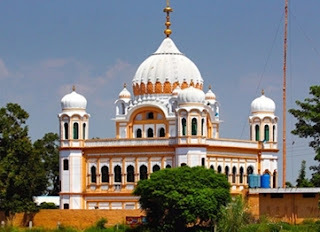 Sometimes it is Lok khanda, then Agam Khanda, Satt Khanda, Alakh Khand, and finally it is Radha Soami Dham where you can have darshan (see) the Aggam purash the God. The journey of other sects of yogis culminates at such a khanda where one can see the Lord Shiva. 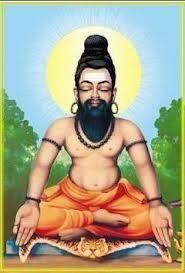 Other faith have differing concepts as to where the God the Allah or Ram or Budha resides. But most people have faith that God resides some where far away in the sky. It could be some other planet or grih or some other sky. Some believe there are 14 layers of universe. Guru sahib has beautifully replied the yogis that our temple is mother earth the creation of God where the Great Drama of life is in action. Guru has then described the beauty of earth where there are infinite numbers of khandas the regions or realms. Where there is water, the fire, the winds. Many seasons visit the earth. Our temple or our place of worship is the very earth. There are millions of types of living beings of various colours and various names. Who is near to God depends upon his actions and the grace of God Himself. This is the kind of philosophy of Dharam khand here that attaining knowledge one gets the idea that God approves the activity (and not renunciation from work) There are large numbers of dieties, kings, Budhas here. The beauty of region of labour is un-describeable. So many Brahma (workers) are busy shaping the world (doing various kind of works) The beauty of realm of labour is energy and power which shapes many a heroes and warriors like Rama. Where bhagat the devotee one who lives within the will of God, who is participant in the life process, the one who is committed to truth and who is in the state of ananda the ecstasy it is there where God resides the realm of truth. He gets amused seeing His creation in action. So our heaven is this state of truthfulness the Sachkhanda. It is not far away in the sky or ether. It is right here.